The most requested feature for WP Migrate DB Pro is the ability to fire a migration from the command line (CLI) and via a function call. Today I’m super excited to announce that the CLI addon will be available with the release of WP Migrate DB Pro 1.4. The function currently requires you to use migration profiles. The ‘1’ parameter in the example above will initiate a migration with the migration profile ID of 1. The IDs of your migration profiles are displayed to the left of the migration profile name on the profile selection page. To use the “wpmdb” command with WP-CLI simply install our WP-CLI community package using the provided instructions. The command can also be viewed and downloaded directly via our github repo. The “wpmdb” command is registered within the CLI addon, so as long as you have the CLI addon activated you should be able to use it. If you’d like early access to CLI migrations, sign up for the beta mailing list. As always, we love hearing your feedback and suggestions. Please feel free to leave your thoughts in the comment section below. 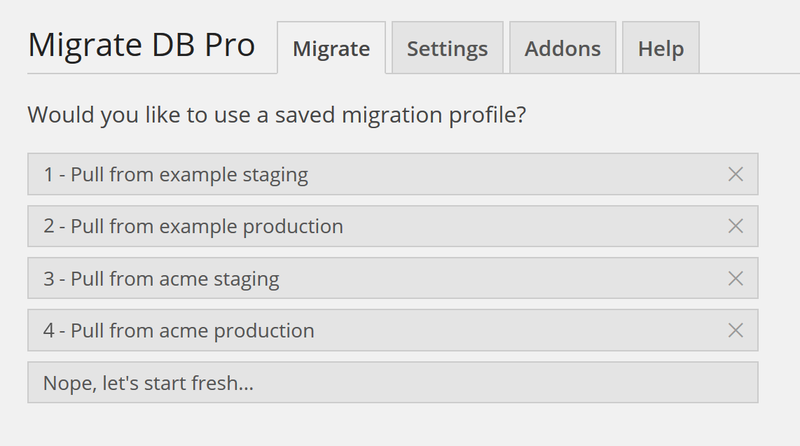 This entry was tagged WP Migrate DB Pro, WordPress, Plugin, New Features, Coming Soon, CLI, Automation. Chris wrote a ton of code and helped lots of customers for Delicious Brains during his 2-year stint with us. He has since moved on to other things.